Summers in the savanna is hot and dry. The rivers are nearly empty and all the animals fight for a place to drink. 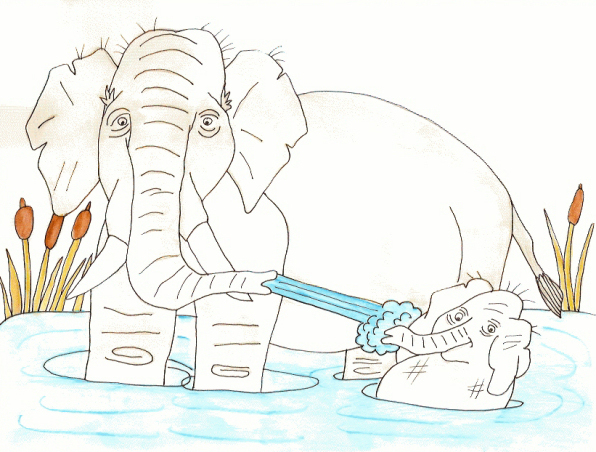 Tambika and her baby elephant, Onoori, stood at the edge of the watering hole. Lions, tigers, giraffes, wildebeest and monkeys all stood around, lapping at the warm, dirty water. “When is it going to rain? I want some clean, cold water. This water is dirty,” Onoori said. “It has been a long summer, Onoori. I'm sure it will rain soon. The winds have started blowing and that means the monsoons will come in a few days,” Tambiki explained. For the next few days the wind blew, hot and dry. Dust blew through the trees, coating Onoori's body with a fine layer of dirt. The watering hole shrunk to just a puddle. Tambiki and his son couldn't get anywhere near it. Lions guarded it ferociously. Onoori cried with thirst. Onoori stood gazing up at the clouds. A raindrop splattered on his face and then another, and another. Soon the clouds burst open and rain poured down. Onoori let it wash the dirt off his tough hide. Water puddled around their feet, running into small streamlets, which ran into the river. All the animals in the savanna rejoiced at the rainfall. Onoori opened his mouth and let the rain fall into it. “It's raining! It's raining!” He filled his trunk with water and sprayed it on his mother. “That's quite a trunkful of water, Onoori.” Tambiki laughed and sprayed him with a much bigger trunkful. The rain stopped for a few hours that night. Tambiki and Onoori stood on the river bank. Across the wide river she saw the lions. Further down she saw the giraffes, the zebra and wildebeest. There would be no more fighting for a place at the watering hole. The rains had come at last.